walk away from the crime scene with a multi-million payoff. In July 2012 it was revealed that disgraced former chief operating officer at Barclays Jerry Del Missier had been allowed to walk away from the company with an £8.75 million payoff. In the banking world massive financial rewards for failure are commonplace, but De Misser's payoff isn't just a reward for failure, it is a reward for outright criminality. De Misser was forced to resign after it was revealed that he was the highest ranking Barclays employee to explicitly instruct staff at the bank to fraudulently manipulate the Libor inter bank lending rate. The bank was fined £290 million by regulators in the US and UK and now faces the possibility of defending dozens of £multi-million civil lawsuits brought by investors and other financial institutions as well as the possibility of facing criminal proceedings in jurisdictions where they have not bought themselves immunity from prosecution. It is quite incredible to see a guilty party leaving the crime scene with a multi-million pound payoff, something that could only happen in the world of high finance. Had the crime been drug dealing, benefit fraud, VAT fraud or illicit arms dealing, does anyone believe that one of the key players would be allowed to simply walk away with such a vast payoff? 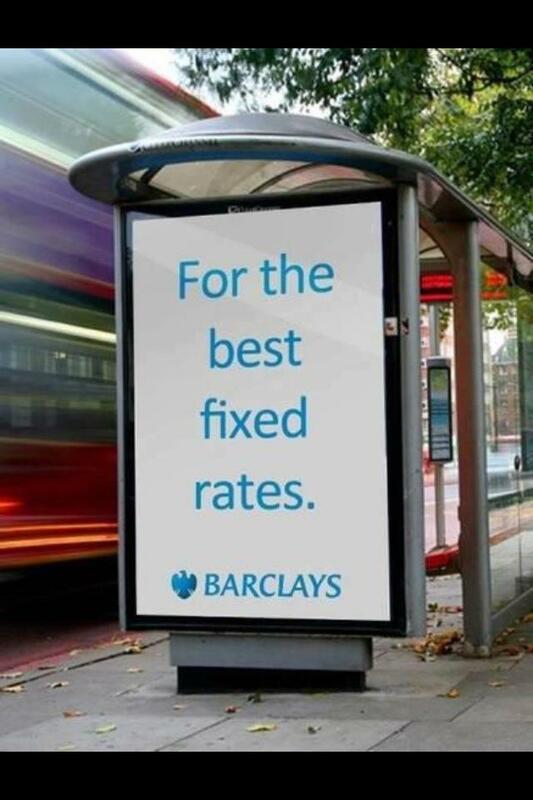 One of the most shocking aspects to the Libor fixing scandal is that Barclays were originally founded as an ethical Quaker bank. For those of you that don't know much about Quakerism, there are no hard and fast rules but the religion was founded on a platform of egalitarianism, abstinence and an opposition to gambling. Barclays and the numerous other small Quaker banks it subsumed were originally founded in order to provide credit to ethical enterprises. As the bank became ever larger and further separated from it's historical roots, the baggage of ethical consideration was jettisoned in the pursuit of ever bigger profits. 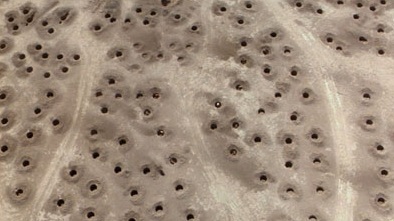 The warning signs that the Quakers had inadvertently spawned an amoral monster were there from as early as the 1980s, when Barclays were one of the few UK based financial institutions to completely ignore the boycott of apartheid South Africa, earning them the nickname "Boerclays". In 1997 De Missier and Bob Diamond were two of the key players in the formation of Barclays Capital, the casino banking wing of the institution. It is hugely ironic that a bank originally founded by people with a strong ethical objection to gambling went on to become one of the biggest players on the global banking casino. If it wasn't bad enough that an ethically founded institution became a big player in the world of financial sector gambling, they also set about deliberately defrauding the global casino by manipulating the Libor rate. 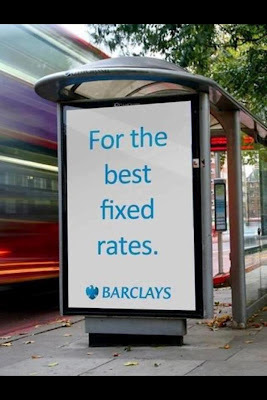 Barclays are far from the only criminal institution in the UK financial sector, RBS and Lloyds are also being investigated for rigging Libor rates and HSBC have recently been caught laundering money for drugs cartels. However it seems these institutions and their employees have little to fear. A fine that is orders of magnitude smaller than the profits they made from their criminal activities, multi-million pound payoffs for guilty parties and no threat of criminal prosecutions would be the worst they could expect in the current climate. If the UK authorities do not bring criminal charges, lock up some corrupt bankers and begin confiscating their ill gotten gains, this will send a signal that there is absolutely no deterrent to financial sector corruption and criminality in the UK and bankers will continue to behave like a bunch of corrupt, amoral criminals. The UK should follow the example set by Iceland, a nation that refused to assume the odious debts of their neoliberalised financial sector and have hired a team of international bounty hunters to track down the corrupt bankers that destroyed their economy. The problem is of course, that the financial sector have a de facto controlling interest in the Tory party, meaning that the Tories will do absolutely anything within their powers to protect the interests of the criminals that operate out of the deregulated, neoliberalised London banking casino. share their extremely wealthy and privileged background? On the 25th of July 2012 the Office for National Statistics announced that the UK economy shrank 0.7% during the second quarter of 2012, meaning that the UK is in the worst double-dip recession since quarterly figures were first produced back in the 1950s. The ONS padded out the dismal economic figures with a package of pre-made excuses such as bad weather, supposed structural weaknesses in the manufacturing and construction sector and the extra bank holiday for the Queen's Jubilee celebrations. It is difficult to figure out what the ONS are playing at by offering a list of pre-packaged excuses in lieu of actual economic analysis, other than trying to curry favour with the Tory party top brass by refusing to mention the elephant in the room; George Osborne's ideologically driven adherence to socially damaging, self-defeating, neoliberal pseudo-economics dressed up as "austerity". By refusing to even hint at Osborne's culpability for the third consecutive quarter of dismal economic performance the ONS are now in the minority. Liberal Democrat peer Lord Oakshott responded to the 0.7% economic contraction by called Osborne a "work experience chancellor" who has "no business experience [and] has never worked outside politics". Only a few days previously the Tory mayor of London Boris Johnson criticised Osborne's cut-now, think-later economic policies and a number of high profile (and normally very Conservative) business organisations have also publicly criticised Osborne's mindless obsession with cost-cutting. The head of the CBI, John Cridland criticised Osborne's ineffective growth strategy, Pierre Williams of the Federation of Small Businesses claimed that Tory strategies to improve funding for growth industries simply hadn't worked and the head of the BCC, John Longworth went even further accusing Osborne of "stifling growth". Even the IMF have shown signs of losing faith in Osborne's ideologically driven austerity experiment and they are the most powerful pushers of neoliberal pseudo-economics on Earth and the beneficiaries of £40 billion worth of Tory largess. If Osborne's strategies are considered too extreme for hardline Tories like Boris Johnson, assorted Tory supporting British business leaders and even the most powerful ultra-conservative neoliberal pushers on Earth at the IMF, it is quite remarkable that the ONS have refused to even consider the possibility that Osborne's obsession with implementing defunct neoliberal pseudo-economic reforms may have something to do with the desperate state of the economy. Brendan Barber, the general secretary of the TUC, pointed out that the UK economy is now actually smaller than it was when the Tory led coalition came to power in 2010. An astonishingly bad economic performance given the all time low 0.5% Bank of England base rate, £375bn of quantitative easing cash handouts to the financial sector and the lowest cost of government borrowing in recorded history. Osborne's ideological experiment has been nothing short of an economic catastrophe and a crystal clear vindication of the many people who that tried to tell Osborne and the Tories that trying to cut your way out of a recession is economic lunacy. The fact that the economy has actually contracted over Gideon's time at the helm is absolutely terrible news for him because a shrunken economy means a smaller tax take. A smaller tax take means that savings made through his ideologically driven cost-cutting measures will be wiped out by losses in tax revenues, meaning that the structural deficit will remain. This latest 0.7% contraction shows up Gideon's economic projections as the insanely over-optimistic fantasies they always were. Without a growing economy, severe cuts in spending wont work, and with severe spending cuts the economy wont grow. Still Osborne has never been one to accept criticism, his statements on the shocking scale of economic contraction consisted of little more than veiled attacks on the previous Labour administration and excuses about problems in the Eurozone. Both of these excuses are transparently lame. Osborne's statement that "We all know the country has deep-rooted economic problems" is clearly a thinly veiled attack on the previous administration. Neo-Labour were culpable of allowing the financial sector to inflate a vast bubble of "easy credit" that eventually resulted in the most significant economic crisis since the Second World War, however in the subsequent two years they took measures to get the economy growing again. Osborne inherited a weak but recovering economy from Labour and drove it rapidly back into recession. Osborne's "debt crisis abroad" excuse is even more pathetic, yes there are problems in the Eurozone, but these are largely problems created by austerity. Thanks to the strong economic performance of Germany and the relatively stable economic performance of France, the chaos in Spain and Greece has largely been balanced out if the Eurozone is taken as a whole. All four of Britain's major export markets (the US, Germany, France & the Netherlands) are weathering the economic storm much better than the UK and it would be fair to expect the UK to benefit from the fact that there is still demand in the economies of their four key trading partners, however under the Tories the trade deficit has been ballooning back towards pre-crisis levels, meaning that the economic benefits of UK exports are more than cancelled out by the UK reliance on imports. The fact that Osborne has concentrated his energies on his facile neoliberal cost-cutting exercises, digging for dirt in order to smear his political opponents and giving huge tax breaks to his rich mates instead of supporting the manufacturing and construction sectors has had the triple consequence of reducing aggregate demand, increasing the trade deficit and stifling economic growth. Given the abject failure of Osbornomics, one is reminded of David Cameron's comments in regard to the Barclays Libor rigging scandal: "People have to take responsibility for the actions and show how they're going to be accountable for these actions....It's very important that goes all the way to the top of the organisation." I'm pretty sure that this sentiment will be completely forgotten about when it comes to Osborne's catastrophic mishandling of the UK economy. 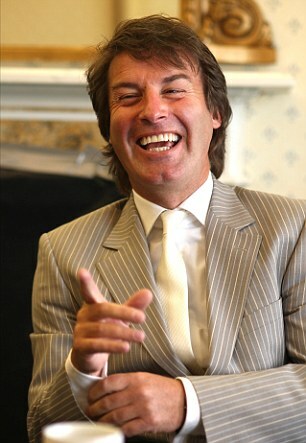 Tory donor to be caught tax-dodging. In July the subject of tax-dodging burst back into the headlines after the Observer published details of an astonishing study showing that the global uber-rich have stashed at least £13 trillion in tax havens around the world, an amount greater than ten times the entire economic output of the UK and larger than the 2011 GDP of the US and Japan combined. This revelation came the day after it was revealed that a major Tory donor had been forced to pay over £2 million in back tax after a tax tribunal ruled that George Robinson must pay income tax and National Insurance contributions on the profits from the attempted tax dodging scam he had arranged with his business partners. In the wake of these revelations the Tory propaganda machine rumbled into action with a new strategy aimed at deflecting attention away from the uber-rich tax dodgers and extremely dodgy Tory donors by trying to shift the blame onto ordinary people. The strategy was spearheaded by Treasury secretary David Gauke who began mouthing off about how paying a plumber cash-in-hand is "morally wrong" because it denies income to the treasury. The Tory attempt at deflecting criticism away from the tax-dodging banks, corporations and uber-rich that have hidden away £ trillions in tax havens is completely transparent to anyone but the deluded reactionary halfwits it was presumably aimed at. There is so much wrong with Gauke's deflection strategy that I could fill a whole article, however I'm going to limit myself to pointing out a few of the most glaring flaws. It is clearly not "morally wrong" for an individual to pay for services in cash. Paying in cash does not deny the treasury anything. Moral culpability falls on the service provider that doesn't properly declare their income. This is not just "common-sense" or a matter of opinion, it is part of UK tax law. The cash-in-hand economy does cost the treasury money, but highlighting this as the main economic problem when it is dwarfed by the scale of corporate tax-dodging is clearly just a deflection strategy intended to protect the interests of rich Tory party backers. What makes shifting wealth to tax havens significantly worse than the cash-in-hand economy is not just the scale of it but the fact that tax haven wealth is removed from the economy entirely, whilst a significant proportion of cash-in-hand wealth is recycled back into the UK economy. This means that the economic harm to the UK caused by cash-in-hand tax dodging is generally far less than it would have been had the wealth just been siphoned away into a tax haven. charge of the Tory deflection strategy. 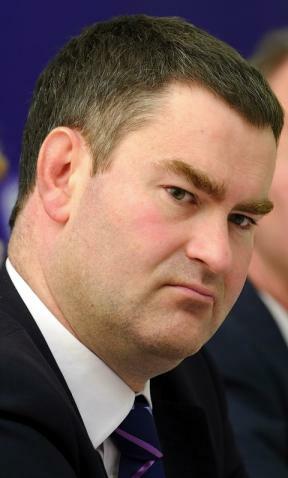 It would seem that Gauke and the Tories have not learned their lesson from the Jimmy Carr case; that proclaiming moral indignation about tax-dodging is completely hypocritical when the Tory party is funded and supported by a legion of tax-dodgers, including the aforementioned George Robinson, their biggest donor and serial tax-dodger Michael Ashcroft and the tax-dodging singer Gary Barlow. Not only do the Tories take financial donations and free publicity from tax-dodgers, several key Tories benefit directly from tax-dodging, including their leader David Cameron who inherited hundreds of thousands of pounds from his father's tax-dodging empire and George Osborne who stands to inherit several million through a tax busting family trust fund. As one commentator on another blog pointed out, "It'll be a bloody cold day in hell before I begin taking morality lessons from the Tories". The Tories seem to be more preoccupied with "managing the message" on tax-dodging than with actually doing anything to combat the avoidance/evasion of UK taxes. Firstly, many of the World's most notorious tax havens are UK administered Crown dependencies such as The Cayman Islands, Bermuda, Jersey and Guernsey. If the government were serious about combating tax-dodging they should set about imposing trade embargoes and economic sanctions. One possible strategy could be to ban all transfers from tax havens to Britain and other law-abiding European countries except where it could be proven that full tax had been paid on the original funds before transfer to the haven. This means that tax-dodging shell companies would have to come clean about who really owns and benefits from them and depositors would then face a choice between being unable to spend their cash in the places they prefer to live, or repatriating their cash and paying a substantial fine. A fairly simple change to government spending rules would also help. The rules must be changed to ensure that any company or individual in receipt of government funds (subsidies, loans, outsourcing contracts, care home fees, PFI contracts, housing benefit payments, procurement contracts, interventions [bailouts] or other forms of state payments) must either be British based or a British subsidiary and pay their fair share of tax. This would mean that any company hoping to suckle the teat of taxpayer generated government funds would have to avoid using tax loopholes and avoid facilitating the tax-dodging activities of their employees by paying them via "service companies". If they want to generate profits from taxpayers' cash, they must pay tax on their profits. I can hardly see how the Tories would be able to oppose such a fair sounding strategy other than by just completely ignoring it as Osborne and co have done so far. Another rarely mentioned area of tax-dodging is the UK drug trade which is worth £ billions a year. All drugs should be legalised, regulated and taxed. The harder ones like cocaine and heroin should be prescription only. Obviously some people would grow their own cannabis and distribute it to their friends, but there would still be plenty of money to be made from cannabis through properly licenced cannabis shops. Consumers would soon switch to buying their drugs from proper regulated and tax paying outlets, apart from a minority that would prefer to grow their own easily cultivated drugs like cannabis and magic mushrooms, as long as these home growers do it for personal use or to give away, there would be no tax evasion going on. It has been estimated that the state would save at least £18 billion a year if drugs were legalised. Not only would the legalisation of drugs bring in a lot of tax revenue and create vast savings in policing, anti-drugs propaganda and detention, it would also massively reduce a lot of the social harms associated with prohibition (acquisitive crime to pay massively inflated street prices and associated high insurance costs, sale to minors, contaminated drugs, overdoses due to inconsistent quality, drug pushing, funding of violent drug gangs, cartels and terrorists....). The legalisation of drugs is becoming a no-brainer. Cannabis has been de facto legalised in many states of the United States (which is where the ideologically driven push for drug criminalisation was sparked off by a bunch of illiberal moralising puritans in the first place). Decriminalisation in Portugal has seen vast falls in acquisitive crimes and addiction rates. Even people normally considered to be unthinking reactionaries are recognising that the "war on drugs" has been a complete failure, as evidenced by 60% of Sun readers recently voting that drugs should be legalised. The only thing standing in the way of a sensible drugs policy (that more than pays for itself) seems to be the puritanical and prohibitionist attitudes of the political classes. If the government adopted these three strategies (of pressurising tax havens, outlawing state funding of tax-dodging enterprises and legalising drugs) the UK would increase tax revenues (and cut wasteful government spending) by tens of billions of Pounds per year. What is Boris up to? Over the years the London Mayor Boris Johnson has carefully crafted a demeanour of harmless buffoonery with bumbling appearances on the topical news quiz Have I Got News For You, an occasionally outlandish dress sense and his trademark scruffy blond barnet. I am of the opinion that one of the core Tory party strategies is to hide their malicious intentions behind a smokescreen of feigned incompetence and that Boris is one of the most adept at using this strategy. 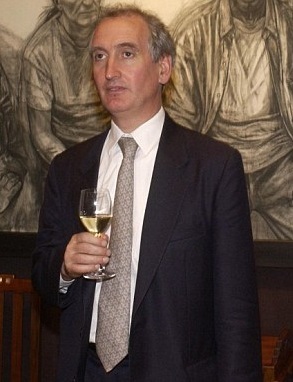 Behind this public image of harmless upper-class twittery there lies a cool and calculating political strategist. This "don't blame me, I'm just an idiot" self-defence strategy seems to be underpinned by one of the most infuriating adages in the English language; Hanlon's Razor, which goes "Never attribute to malice that which is adequately explained by stupidity". In my opinion this adage is completely backwards. Despite a few notable exceptions, extremely stupid people rarely manage to obtain positions of political power, so to offer them the eternal excuse of "incompetence" is idiotic. If these people have demonstrated the drive and determination to get their hands on the levers of power, should we assume that they have just been pulling the levers randomly until they caused some unforeseen consequence? Or should we generally assume that they were pulling the levers for their own personal benefit until they got caught out? When analysing the political activities of neoliberals, it is always useful to remember that one of the fundamental assumptions that underpin neoliberal theory is that economic efficiency is supposedly achieved through individuals pursuing their own personal self-interest. If we accept that the key factor behind most of the litany of Tory scandals is incompetence rather than malicious self-interest, we are actually conning ourselves into believing that these people are ignoring one of the tenants of their beloved greed-is-a-virtue neoliberalism and allowing ourselves to be tricked into thinking that they are too stupid to even serve their own self-interests. This strategy of feigning uselessness is not just limited to modern day Tories. Top businessmen such as Nick Buckles of G4S and Bob Diamond of Barclays have tried feeble last-ditch attempts to protect themselves from criticism with claims of ignorance of the widespread corruption and incompetence within the companies they were supposedly running. 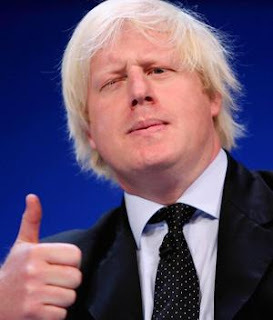 Returning to Boris Johnson, I believe that within his recent statements to the press there is plenty of evidence that this guy is a cold and calculating political strategist rather than the charming and eccentric upper-class buffoon he pretends to be. In the wake of the Barclays Libor scandal and the HSBC money laundering scandal Boris has been keen to speak out against the tightening of financial sector regulation, in his words: "What I certainly don't think you should try to do is address people's general economic malaise and anxiety by over-regulating one sector, and causing gloom and despondency in financial services". 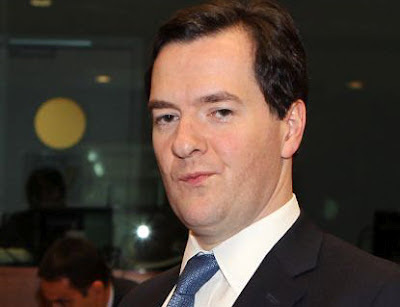 He has also been keen to put the boot into George Osborne's disastrous self-defeating austerity agenda. temperament are going to eventually lead to his downfall. The reason he is attacking Osbornomics is absolutely clear, Osborne's ideological obsession with austerity has driven the UK back into recession. More and more people are recognising the idiocy of imposing across the board cuts at a time of reduced aggregate demand. Several extremely conservative business organisations such as the CBI and the BCC have publicly criticised Osbornomics and called for more government action to increase investment, instead of maintaining their ideological obsession with cost-cutting. 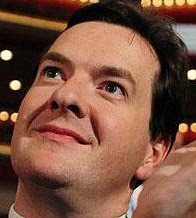 Osborne's response to the criticism has been a quite astonishing combination of hubris and idiocy. Alienating British business leaders by deciding to turn the blame back onto them, the very people that were cheering him to the rafters just a couple of years before, is an act of unbelievable petulance and a lunatic political strategy for a man that needs the support of the private sector more than ever. Osborne's hubris looks certain to lead to his downfall and Boris is positioning himself ahead of the curve. It seems inevitable that there is going to be an almighty backlash against Osborne's mindless obsession with austerity (possibly when the third consecutive quarter of negative economic growth is announced). Boris wants to be able to say that he he was one of the ones speaking out against Osbornomics so that he can be seen as one of the few Tories to have opposed Osborne's failed economic "strategy". He is hoping that this will be enough to win him support from business leaders. His trenchant defence of the London financial sector is a completely different kind of strategy. On the surface, speaking out in favour of the corruption riddled bankers at a time of public anger looks like a very poor strategy for a political populist like Boris. He knows that the public are rightly enraged about financial sector corruption and greed so why is he doing it? The answer is actually quite simple, the financial sector are by far the biggest donors to the Tory party. They donate such a large proportion of Tory party funds that they have a de facto controlling interest in the running of the Conservative Party. 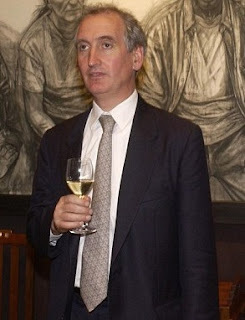 Making himself an unofficial spokesman for the financial interests of the London financial elite, when everyone else is playing up to the public outrage looks a lot like a strategy to assume control of the Tory party once Cameron and Osborne are turfed out. So there we have it; the subtext of Johnson's statements make it abundantly clear that he is positioning himself as the lead candidate to replace Cameron as the leader of the Tory party. 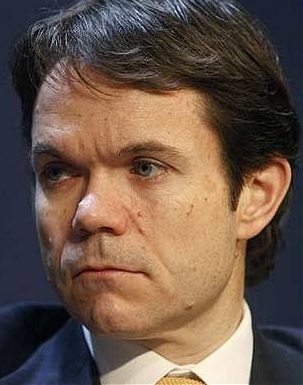 In his recent statements he has positioned himself as the friend of British businesses and of the London financial sector, probably the two most important groups he needs to impress if he is serious about replacing Cameron. Boris isn't the blundering upper-class twit that people like to think he is, he is a calculating political strategist who seems to be in the process of launching an audacious power play. How can the argument for increased state spending be won? "austerity" is basically just borrowing cash to pay people to dig holes? I recently came across an interesting article on a left-leaning, Labour supporting website which called on the government to take advantage of all-time low government borrowing rates in order to invest in a number of projects such as a "national restoration scheme", to massively boost the number of apprentice schemes and to stimulate the house building sector. In general I agree with the argument but the author badly let herself down with the statement that "It doesn’t matter too much what we build, but it matters very much that we start to build something. And soon". In the comments section I presented the case that it really does matter what is built. That what is needed is investment in the kinds of projects that can create proven social and economic returns (strong fiscal multipliers). I tried to explain that "building for the sake of building" is no good and that you might as well pay people to dig holes and fill them back in again if that is your argument. The author responded to my point by saying that "the great irony is that paying people to dig holes then fill them back in again would work too". Whilst I admit that employing people to essentially do nothing can boost aggregate demand in the short term (via wages and increased consumer spending, lowered welfare costs), it would be foolish to create the impression that your policy is to just chuck money around willy-nilly. Indiscriminate spending would be just as irrational as the Tory policy of mindlessly cutting spending for the sake of cutting spending, even when the cuts being made are obvious false economies. It is wrong to fund economic activity that generates fewer long term economic, social and environmental benefits than it actually costs. Firstly because there is already plenty of evidence to show that sustained investment in the construction of social housing (for example) reliably creates significantly more economic (and social) benefits than initial investment costs. And secondly because "paying people to dig holes" or funding activities with low fiscal multiplication values (such as tax give-aways for the super-rich or funding absurd vanity projects) is just creating a debt for future generations to cover, that is larger than the short-term boost in aggregate demand. No politician in their right mind should be arguing in favour of wasteful spending at the expense of future generations, it just provides ammunition to the opposition and more than that, it is morally wrong to expect future generations to foot the bill for our short-term economic gains. The moral bankruptcy of shafting future generations for short term political gains is a lesson that should already have been well and truly learnt from the reckless creation of hundreds of billions of pounds worth of toxic PFI debt legacies. Don't get me wrong, I'm wholly in favour of fiscal stimulus but there really should be more research into the most effective multipliers, so that proponents of state investment can adopt an evidence based approach to stimulating the economy. Allowing them to create strong factual arguments in favour of funding projects that have been proven to be more likely to provide long-term economic, social and environmental benefits. 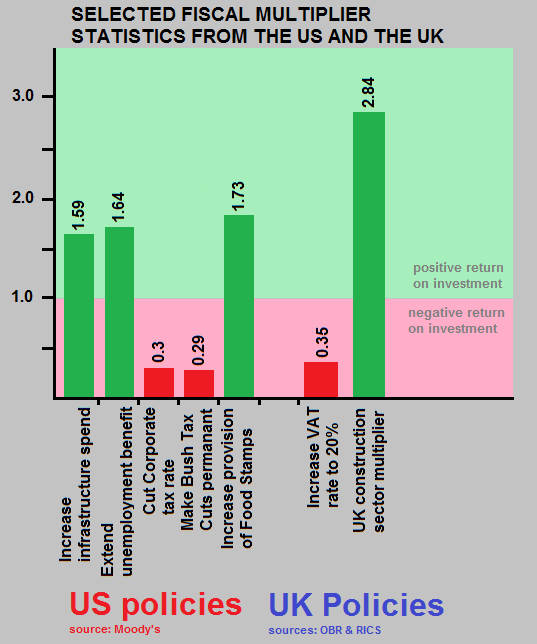 If a more reasoned, scientific approach is taken, increases in spending on projects such as social housing, public transport infrastructure, research and development, education and high-tech industries can be presented as a short-term stimulus to boost the economy now, that will also improve economic prosperity for future generations, with an evidence base to support the assertions. It would be far from easy to define an acceptable methodology, with a great deal of work needed to properly define how net benefit is calculated. The economic returns on investment must be considered but not at the expense of externalities such as social cohesion or the destruction of non-renewable resources. To give a very brief (and over-simplified) example of what I mean: If a scenic rural railway line is re-opened, the combined boost in short term aggregate demand during the redevelopment process and the long-term revenues on the line may never cover the investment cost, but if the economic benefit to the local economy (increased viability of small local businesses, increased tourist appeal, etc) and the environmental benefits (a few hundred people using the train to commute instead of making long individual car journeys) are considered, the benefits may begin to outweigh the negative economic returns than the functioning of the line is considered in isolation. I'm pretty sure the adoption of a carefully considered evidence based policy when it comes to allocation of state funds and the sourcing of articulate and economically literate spokespersons to argue the case could be a big vote winner, especially given the rising public anger at the Tories brand of mindless, self-defeating, ideologically driven, seemingly incompetent, "cut-now, think-later" austerian pseudo-economics. slashing of flood defence budgets. In many ways Caroline Spelman is the perfect example of the modern Tory. From the moment she became environment secretary in the coalition government she set about currying favour from George Osborne and David Cameron by volunteering huge 30% austerity cuts to her own department and drawing up plans to sell off publicly owned forests. The forests sell-off was one of the first of a litany of PR disasters to hit the coalition government. Under huge public pressure Spelman's plans to sell-off publicly owned forests to the private sector were shelved and then quietly killed off. Such a spectacular misjudgement of public opinion is easy to understand when you consider that the prime motivating force behind the modern day Conservative is to reduce the role of the state at all costs. To an ideologically driven Tory, it is "common sense" that all publicly owned assets must be sold off to the highest bidder as soon as possible. Spelman's self inflicted 30% budget cuts to the environment department in order to win favour from the cut-now, think-later austerians at the top of the Tory party were even more insane than her plans to sell off the forests but it took a little longer for the disastrous consequences to become clear. Thanks to Spelman's brutal self-inflicted cuts to her own department more than 300 planed flood defences had to be cancelled because of her £860 million pound cut over the 2010-2015 period. It has been estimated that for every £1 spent on flood defences the country saves £8, an astonishingly high fiscal multiplication effect of 8.00. This means that cuts to flood defence budgets are a spectacularly obvious example of false economies (chucking the baby out with the bathwater). After the huge floods of 2007, the Pitt review concluded that spending on river and coastal flood defences needed to be increased. To their credit Neo-Labour actually did pretty well, boosting spending on flood defences by 33% between 2007 and 2010. Spelman's ideologically driven cuts undid much of their work and ensured that spending fell back again by over 25% in the first year of the new government. Exceptionally wet weather in the summer of 2012 saw large floods overwhelm thousands of homes and businesses and cause hundreds of millions of pounds worth of damage across the UK. Kendal in Cumbria was one of the locations particularly badly hit and was one of the 300 places to have funding for flood defences cut as part of Spelman's barmy "cost-cutting" exercise. 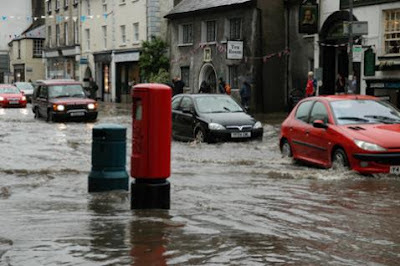 Perhaps the people of Kendal are glad to know that the misery and financial cost of being flooded is simply a consequence of Spelman's attempt to win favour with the Tory grandees, that their lives have been turned upside-down just to serve her personal self-interest. Spelman should go far in the Tory party, she has all of the traits of the modern Conservative, a noxious blend of incompetence, malice, economic illiteracy and pure unrestrained self-interest. Tories to shell out over £6,000 per uniform. When did G4S realise that there was a problem and why wasn't it spotted far earlier? When was the Government first informed by G4S that they couldn't provide the number of guards it was contracted to? What form did Government oversight of the contract take, and why were recruitment problems not spotted sooner? Why do politicians have such an appalling track record of applying rigorous penalty clauses to outsourcing contracts? With G4S chief executive Neil Buckles and Home Secretary Theresa May both hiding behind the "I didn't know what was going on so I shouldn't be held accountable" excuse, who, if anybody will be held accountable for this fiasco? How can a 12 fold increase in "management fees" written into the contract after it was renegotiated by the Tories be justified? How much of the cost of providing at least 3,500 soldiers and hundreds of police to cover the missing G4S workers is going to be borne by G4S? Will any action be taken to prevent G4S from bidding for future government contracts until they can prove that they have improved corporate oversight and accountability at the company? In the wake of this debacle, does anyone still consider it a good idea to outsource even more police work to this company? Why have UK governments over the last three decades tended to assume that the private sector is always more efficient than the public sector? These are all questions that have appeared in one form or another in the mainstream press and the public deserve answers. There is one question that seems to have eluded the majority of the mainstream media which to me is one of the most important. It is all to do with the renegotiation of the contract terms in December 2012 and the cost of uniforms. According to the Guardian G4S were originally contracted to provide 2,000 security staff and a sum of £3 million was agreed to cover the cost of providing uniforms. At an average cost of £1,500 per uniform the original deal looked like an eye-wateringly expensive rip-off for the taxpayer, however instead of trying to force these costs down when the contract was renegotiated, the Tories allowed G4S to inflate their uniform costs to a frankly unbelievable £65 million for 10,400 uniforms, or an average of £6,250 per uniform. If we consider that the company should have already made procurement arrangements for the uniforms of the original 2,000 staff, the costs of the uniforms for the additional 8,400 are even worse at an average of £7,381 per additional member of staff. The immediate response it to wonder how on Earth G4S thought they could get away with charging such an amount? Perhaps they were planning to say "oops, we slipped a decimal point, it was meant to be £6.5 million". However this is beside the point, it should come as absolutely no surprise that a profit seeking private company would try to rip off the taxpayer in order to boost their company profits. The real question should be; who signed off on the deal? The next step for anyone concerned at the sheer scale of this rip-off should be to contact their local MP asking them to determine who signed off on the revised G4S contract and to put pressure on G4S to provide all relevant details of how the £65 million fee for uniforms was actually calculated. You can find contact details for your local MP on the They Work for You website. Defenders of orthodox neoliberalism often try to defend their favoured socio-economic ideology by pretending that "there is no alternative". In this series I'm going to explore what some of these alternative economic strategies could be. Lesson 1. What is a fiscal multiplier? Lesson 2. What is an externality? The next step would to be to introduce routine assessments of the fiscal multiplication effect of government policies (taking externalities such as environmental degredation, use of limited/non-renewable resources, systemic risk, social disorder, health consequences, anti-competitive practicies into account). This kind of analysis would provide useful data on which government services provide good overall (economic, social and environmental) returns and which need to be made more efficient, scaled back or completely abandoned. An approach like this would also prevent ideologically driven fools like Caroline Spelman from slashing state spending on economically beneficial flood defence projects, against the scientific advice and incurring significantly more economic damage that she saved through her mindless adherence to the failing cut-now think-later ideology of Osbornomics. By slashing spending on worthwhile flood defence projects Spelman was clearly just serving her own political interests. She was simply trying to win brownie points and future promotions from the ideological neoliberals that run the Conservative party by demonstrating that she would gleefully inflict the largest proportional spending cuts on her own department, without any consideration for the obvious false economies she was creating. The problem of course is that proper analysis of the fiscal multiplier values of government spending would throw up a lot of results that all three of the neoliberal riddled, corporatist Establishment parties would abhor. Government spending on social housing, public infrastructure projects and welfare projects usually provide good fiscal multiplication values, whilst tax cuts for the extremely rich have provided some of the lowest fiscal multiplication values ever seen. The 2008 Bush tax cut for the super rich resulted in a fiscal multiplication value of just 0.29, meaning that for every Dollar spent (in lost tax revenue) the economic return was just 29 Cents. Compare this to Spelman's flood defence cuts, it has been estimated that for every Pound spent on flood defences the country saves £8, an astonishingly high fiscal multiplication effect of 8.00, or a 27 times more effective use of government funds than cash handouts to the richest people in society (a favoured Tory policy). 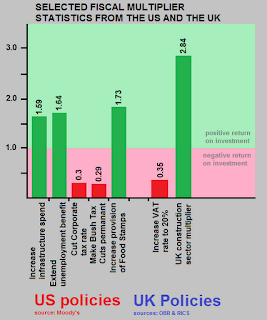 Evidence based policy based on the assessment of fiscal multiplication values would create a situation where government would find it almost impossible to give vast tax cuts to their wealthy mates and financial backers and instead find themselves compelled to increase funding for economically beneficial projects such as building flood defences and social housing, providing healthcare, education and welfare, increasing spending on tax enforcement and cutting taxes that disproportionately effect the poor and ordinary working people (such as VAT and council tax). These outcomes are precisely the reasons that evidence based policy is highly unlikely ever to happen in the UK. The cost of the 2012 London Olympics has ballooned spectacularly to over £9 billion, creating an already vast public debt legacy. Corporate sponsorship of the games has provided around £1 billion in Olympic revenues yet the corporate sponsors have managed to get themselves exempted from paying tax on their Olympic profits, meaning that they will be able to claw back most of their Olympic sponsorship outlay at the expense of the British public via lost tax revenues. The Olympic tax dodge means that the British taxpayer is effectively subsidising the cost of foreign companies like McDonalds and Coca Cola blathering the Olympic games in totally inappropriate advertising for their unhealthy food and drinks. I know I am not alone in finding this legalised tax evasion abhorrent since over 100,000 people have signed the "Stop the Olympic Tax Dodge" petition on 38 Degrees despite a mainstream media blackout on the subject. Once again the the job of protesting against this kind of corporate favouritism has fallen to small independent organisations, independent bloggers like myself and social media activists, whilst the corporate mainstream media prefer to remain silent. One of the most worrying aspects of this mainstream media blackout is that it has allowed the obnoxious BNP fascists to cash in on the outrage and rise to the first page of UK results for search queries such as "Olympic tax dodge" and "Olympic tax" where they have coated their outrage at this situation in a predictable layer of racist language. Speaking of fascists it should be noted that one of the big London 2012 Olympic sponsors Coca Cola were big players in Nazi Germany, with hundreds of bottling plants and they were proud sponsors of the 1936 Nazi Olympics in Berlin. In fact their product Fanta was initially developed to provide sugary drinks to Nazi Germany once supplies of Coke syrup ran out. Perhaps the BNP should be happy that a fascist supporting company like Coca Cola are being allowed to cash in on the Olympic games at the taxpayers' expense? Sticking with the Nazi theme, the Olympic's corporate sponsors have insisted that the British public sector provide them with hundreds of local council staff that they can turn into their own purple shirted "brand enforcement" militia to ensure that nobody but the official corporate sponsors benefit from the Olympic games by using words such as "Gold", "Silver". "Bronze", "Summer", "Sponsor", or "London" in their advertising and to enforce strict monopolies by banning anyone but McDonalds from selling chips within the Olympic zone. The UK population has already provided £9 billion towards the cost of the games, yet the corporate sponsors have shown that they are determined to milk even more cash out of the British taxpayer to subsidise the blathering of their logos all over the games and have even insisted that the taxpayer provide them a private militia of "purple shirts" to rigorously enforce this ubiquitous corporate branding that they have conned the taxpayer into subsidising. These scams would have been great for the corporate sponsors had they not been picked up upon, but now that the public are becoming aware, actually accepting these tax breaks looks extremely likely do more long-term harm to their corporate reputations in the UK than the few hundred million pounds they were planning to scam out of the taxpayer. If you want to help these corporations to see sense and rescind these Olympic tax breaks please take a minute to sign the 38 Degrees Olympic tax dodge petition. Update: McDonalds were the first to try to reverse the tide of negative publicity by stating that they now intend to pay tax on their Olympic profits. Over the following week all the other sponsors agreed to waive their tax-break. The stop the Olympic tax-dodge campaign was a fine demonstration that online activism can work. Olympic priorities: security or brand police? Contrasting the G4S Olympic security shambles and the much more successful deployment of hundreds of Olympic "brand police" (to ensure that only McDonalds can sell chips in the Olympic zone and nobody uses the words "Gold", "Silver", "Bronze", "Summer", "Sponsor" or "London" in their advertising) tells us two very important things. The first thing is the clear demonstration that the public sector can be more efficient than the private sector, since the successfully deployed corporate Nazi purple shirts are all retrained local council staff . An Olympic Delivery Authority spokesperson said that "We are using experienced local authority staff [provided by 30 local councils] who currently enforce street trading and advertising legislation". Meanwhile the state sector is clearing up the private sector mess to bail out G4S by cutting the leave of 3,500 (state sector) soldiers and several hundred (public sector) police to fill the security void left by G4S's abject failure of to properly plan for the event. It seems clear that if you want to get the job done properly, then employ public sector workers. If you have been foolish enough to outsource the work to the private sector, you needn't worry you can always get the state sector to come to the rescue at the expense of the taxpayer who ends up paying twice for security. The second thing that seems clear is that the Olympic organisers seem to have put a higher priority on ensuring that their "brand enforcement" militia are prepared and trained than they have on ensuring that they provide sufficient properly trained security staff. That protecting the interests and profits of their corporate backers has been taken more seriously than the protection of ordinary people that intend to watch Olympic events. That in the world of Olympic organisation, corporate profits trump human lives. Undermining financial sector regulation, a Tory policy. In the wake of the record £290 million fine for Barclays role in the Libor and Euribor interest rate manipulation scandal, one of the most astonishing comments came from the Chancellor of the Exchequer, George Osborne who stated that he is "looking for ways" to prevent the UK regulator (the SFO) from keeping their £59.5 million share of the fine so that the money could go to "the taxpayer". The line that Osborne is attempting to confiscate this cash windfall from the regulators in order to give it to "the taxpayer" is absolutely absurd. £59.5 million is equivalent to about £1 per head of population, hardly a windfall for the "taxpayer", however it could potentially be a huge amount for the UK anti-fraud investigator, who have been under sustained attack from the coalition government. In the wake of the global financial meltdown, one would have expected fraud regulators to be given more powers in order to prevent similar catastrophic failures from crashing the global economy, instead the SFO have suffered several years of severe budget cuts under the guise of "austerity". In 2008-09 their budget to investigate fraud (including within the £multi-trillion London financial sector) was just £51 million, but the Tories have reduced that to £33 million this year and project further cuts to £29 million by 2014-15. Astonishingly it has been revealed that a SFO led criminal investigation into the manipulation of the Libor market had to be cancelled in 2011 due to the lack of funds created by Osborne's austerity measures. It seems that the Tories are intent on keeping to their neoliberal pseudo-economic dogma of reducing regulation, not by introducing further financial sector deregulations (which would be hugely unpopular with the electorate) but by starving the regulators of funding so that they can't even afford to investigate the financial crimes that they know are going on. If the SFO were allowed to keep the £59.5 million fine and use it to fund more investigations into fraud and corruption in the financial sector, they could surely rake in more large fines and begin to appear as an effective deterrent. It should be a major source of embarrassment that 79% of the Barclays fine is to go straight across the pond to the American regulator (the SEC). How on Earth is it justifiable that the huge bulk of the fines go to America for a crime mainly committed by British bankers at a British bank on British soil? If the British regulator was given the additional funding necessary to conduct their own investigations, rather than piggy-backing on the work of the American regulators, they could impose their own fines and perhaps even become self sustaining. 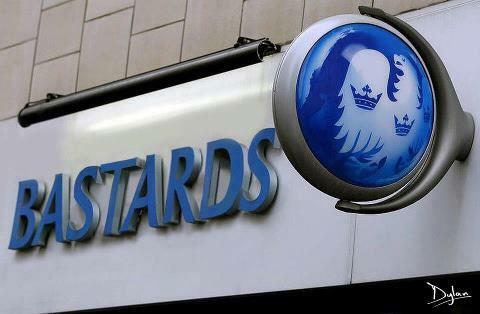 However this will never be allowed to happen since the fraud ridden financial sector effectively own a controlling interest in the Tory party, hence George Osborne's decision to emaciate the UK regulations through "austerity measures" and his determination to ensure that the regulators do not get to keep even their small share of the Barclays fine.